Using Turtle in Aquaponics to Grow Plants: Good or Bad? If you are turtles lover and have them as a pet or plan to keep them. OR looking for an alternative for fish in aquaponics. This post is for you. 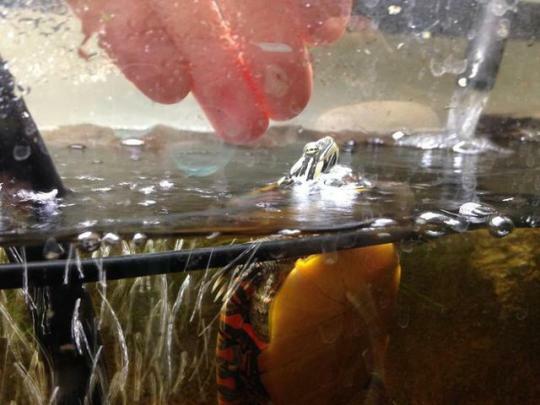 So, why not make a symbiotic relationship of a turtle with aquaponics? So, what plants need from aquaculture in aquaponics? their Waste! That’s a nutrient for them. Unlike some reptiles, Turtles are cold-blooded (ectotherms) and their internal temperature varies according to their ambient environment. In other words, they are cold when the environment is cold and hot when the environment is hot. In hot environments, the turtle has blood that is much warmer than warm-blooded animals. In the warm season, they are also much more active. They become very sluggish in cold environments. This is due to chemical reactions, that control their muscle activity, run quickly when they are hot and slow when they are cold. You will often see turtle basking in the sun to warm up and increase their metabolism. Many turtle owners use heat lamps for them. They will hibernate if it becomes too cold for them. Turtles are air-breathing animals equipped with lungs, so how do they get oxygen underwater? Their cold bodies slow down markedly in winter. They stop breathing through their lungs. They don’t eat and their hearts slow down to the point they beat only once every few minutes. They need little oxygen because their bodies are functioning at such a slow speed. Fortunately, there is almost always a small amount of oxygen dissolved in water (which is how fish survive). They get the small amount they need in winter from specialized tissues found in two places on their bodies — the throat and just inside the tail opening. These tissues have lots of minute blood vessels that permit oxygen to be extracted from the water into the turtles’ bloodstreams. The chemical composition of the turtle’s blood changes so it doesn’t freeze. Next time you pass a pond, think about the turtle, cold and burrowed in the mud. It is an amazing way to survive the winter. Why use Turtle instead of Fish? They poo a lot and produce more waste. More Nutrients. Good for plants? They have much more personality than fish. They are much hardier than fish. Much more interesting, varied diet. Turtles are reptiles and cold-blooded. Interesting? You can keep them as pets. Turtles are easy to market when they’re small, but difficult to care properly for over the long run, especially as they grow. Pet turtles often suffer a cramped, boring habitat, a monotone diet, and neglect. Aquarium filtration for turtles is difficult because they’re messy and they have a massive appetite – most pet store recommendations involve disposable carbon filters and weekly water changes. If you’re using an aquaponic system then microbes in a biofilter will digest the waste. That will eliminate the need to capture the waste in a carbon sponge or drained as effluent and replaced with fresh water. Rather than waste building up + being removed, it is constantly digested. A healthy system digests waste quickly, keeping the water healthy. 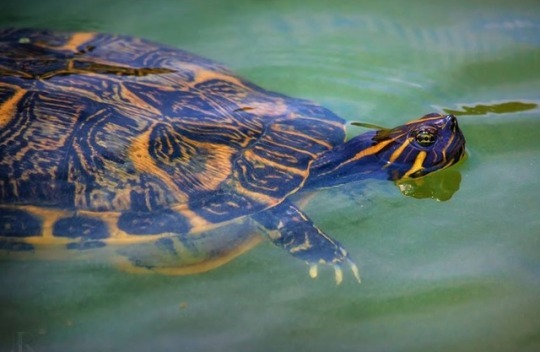 With proper system design, turtles will work well in aquaponics – they must be supported with strong water flow+filtration and a dynamic habitat. Also, be prepared to feed them worms from your compost bin and crickets from your insect culture setup (if you have any). Biggest concern keeping turtles in aquaponics is Salmonella. It is not as common as most people think although many animals, even dogs, can carry it. The reason turtles carry salmonella risk is usually due to poor care. Also, If the risk of salmonella was so great with turtles nobody would own them. Taking Salmonella in consideration, Prevent water from splashing onto the vegetables. Wash your hands before handling the vegetables, then wash your vegetables before you eat them. You could even include cooking any vegetables you grow. But I recommend don’t grow edible plants (As far I know, Turtles are not edible as well). Keep the whole system as decoration. Most of the turtles require sunlight to be healthy. Mind, giving them some? Better make sure your turtles have something to crawl upon to. Other the will grow tired swimming and drown. I have talked to some farmers who made this mistake with keeping frogs in aquaponics. They have to get out of the water, in order to rest and bask in the sun. 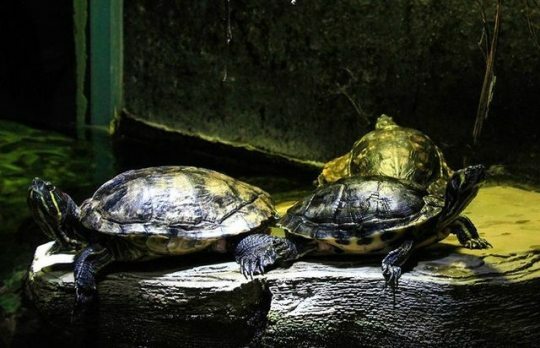 Planning to keep Fish with turtles? Omnivorous turtles will eat fish, invertebrates, fruits and seeds, aquatic plants and algae. It’s all on the menu for them! So better make sure turtle is not a hunter of your Fish. Take care of proper filtration. Is Commercial Aquaponics Sustainable & Profitable?